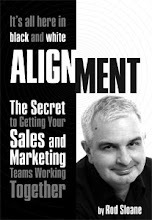 Sales and Marketing Alignment Blog from Rod Sloane: What's your Marketing Strategy? Tony, a friend of mine asked me the other day “Rod, What is your internet strategy?” I didn’t know whether to smile at Tony or slap him. Tony didn’t understand the difference between a marketing strategy and a marketing tactic. And you know that for many years, neither did I. So let me explain the difference. Both of these words are military terms. Can Julius Caesar really help you in your business in 2007? I dunno. Naturally, these terms have been adopted by MBA’s. But today I want to give you my version, the No Bull version, the version that you can use in your business. Let’s start with your marketing strategy? Your marketing strategy answers the following simple question. What is the most important position you want in the mind of your buyer/client? The ultimate perception! The ultimate place! Can you answer that question? Because if you can’t then your client probably can and it may not be the position you want. I find a good word to add to strategy is position. So what’s my strategic position? Just 19 words. Can you document yours? So where do tactics come in? Well tactics are what you do to help your client think of you in your strategic position. So is this note helping be more known, liked, trusted, hired and referred as the UK’s most practical, small business marketing expert? When I speak to groups of business owners do I become known, liked, trusted, hired and referred as the UK’s most practical, small business marketing expert by my target market? Get it? So what are tactics? Simply think of tactics as actions that will help you get closer to your strategic positioning in your client’s mind. Networking, speaking, blogging, messing about on the internet...sorry I mean internet marketing, direct mail these are all tactics. So first work on your strategic positioning then plan your tactics. Of course I smiled at Tony. I would never have hit him; he’s bigger than me that was my tactic.